Bamboo flooring is an environmentally-friendly choice for your log home flooring. Although technically a grass, bamboo makes a beautiful and long-lasting hardwood floor. 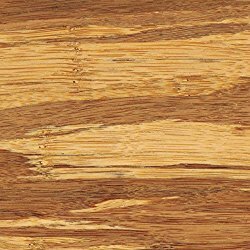 In addition, it is a green building product because it’s a sustainable and renewable resource, taking a few years to grow to maturity instead of the decades it takes for hardwood to grow. Bamboo is quickly replenished as the root continues to grow after harvesting. 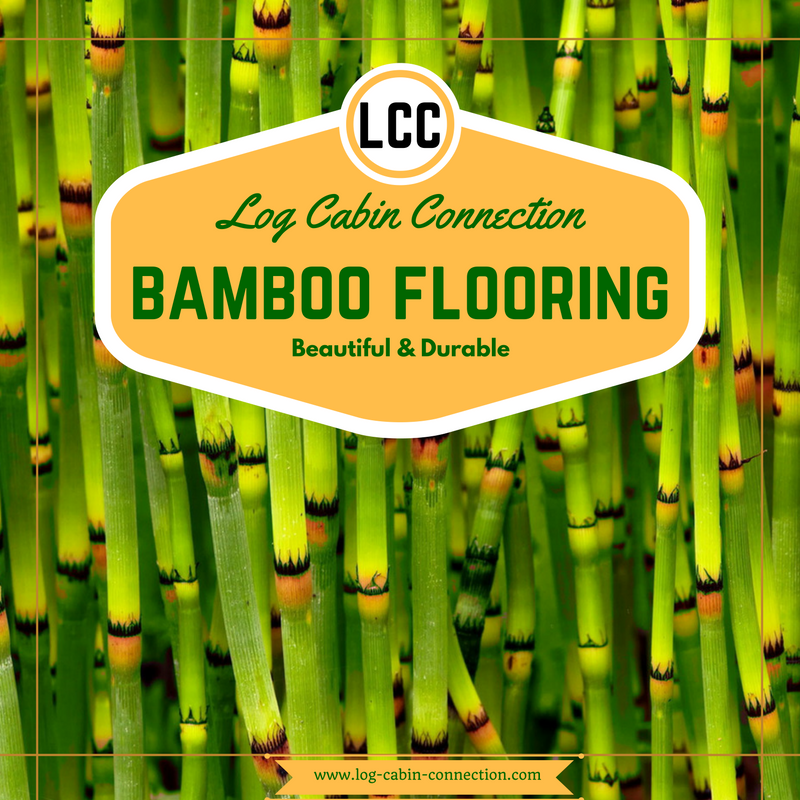 A floor made of bamboo is a warm and welcoming invitation to your log cabin, both decorative and practical. It’s practical because it is incredibly hard. Natural bamboo rates a 1380 on the Janka Hardness scale, higher than white or ash. Even carbonized bamboo is rated at 1180, a higher hardness rating than teak. Floor coverings of bamboo are the ideal choice for homeowners who want the beauty of a hardwood floor but are increasingly aware of environmental issues and choose to install a sustainable green floor product rather than a traditional hardwood floor. 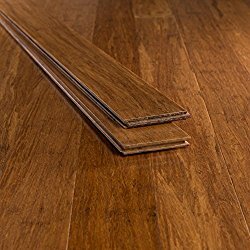 Although many people will picture rough cane strips when they hear bamboo, the truth is that bamboo hardwood flooring is now created by processing and machining the bamboo cane into smooth, luxurious and sensual hardwood planks that invite bare feet yet are tough enough for heavy traffic. When installing a floating hardwood floor like bamboo, it's important to begin with an underlayment. 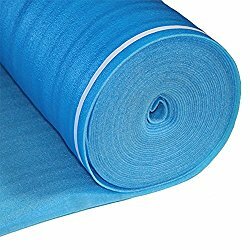 It's simple to install in rolls covering 200 sqft, and serves as a vapor barrier and is mold and mildew resistant. In addition, it provides sound absorption so your floors are whisper-quiet and easy to walk on. 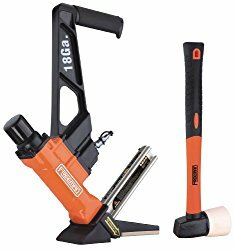 Installation of a nail-down flooring requires a flooring cleat nailer. The cost is more than made up by the fast and easy job it provides. A no-mar foot keeps the tool from leaving marks or scratches and the 18-gauge L-cleats will keep the floor down solid. Floors made of bamboo require the normal care of any hardwood floor. You should avoid using too much water to clean, and avoid harsh chemicals or abrasive cleaners. Dry mops like Swiffers are ideal and make the job easy. You can lengthen the lifespan of your floor by protecting it from sharp furniture legs or high heeled shoes. Keep your floors swept and clean and use entry rugs or doormats to collect sand and dirt from outside. Bamboo comes in different forms, including short laminated strips, wide planks and even tiles. If properly cared for, floor coverings of bamboo will last for many years of comfortable and durable use. Bamboo hardwood floors come in both natural bamboo and carbonized bamboo. The process of carbonizing bamboo simply means that the manufacturer submits the bamboo to very high heat during the curing process and this causes the sugars in the wood to darken, thus lending the carbonized bamboo it’s very distinctive, rich and beautiful color variations and striations. 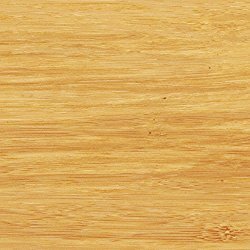 Natural bamboo is a light blond color, making your rooms appear clean and bright. Natural bamboo is approximately 30% harder than carbonized (due to the carbonizing process), making it a longer-lasting product. Strand-woven bamboo is manufactured differently than traditional bamboo flooring. 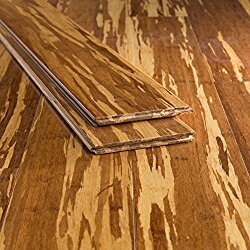 Bamboo strips are coated with resin and compressed before being milled into flooring. This makes strand-woven bamboo much harder than traditional bamboo. Bamboo floors are environmentally-friendly, easy to clean and maintain and ideal for allergy sufferers. Make the right choice for yourself and for the earth – bamboo flooring has both beauty and durability and will enhance the unique appeal of your log home.